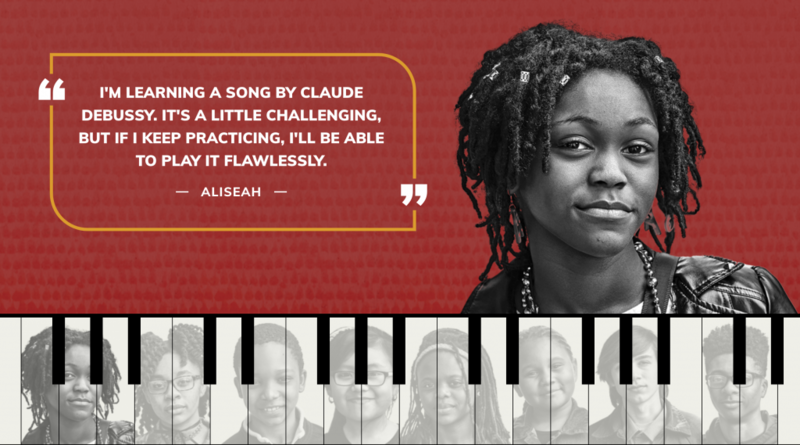 Pianos for People is a nonprofit organization based in St. Louis, Missouri that provides free pianos, lessons, and music camps to children and young adults who otherwise may not be able to afford them. Our team at RobMark has been fortunate enough to work with this inspiring organization for years now, so when they decided it was time to give their website a makeover, we were thrilled to step in to help. Pianos for People was interested in creating a website with creativity, movement throughout the pages, structured organization, and design elements that complemented their new branding. The RobMark team brainstormed how we could take Pianos for People’s old website and transform it into a more modern and intriguing website. Starting with the homepage, we decided to showcase photos of several of the organization’s students along with quotes they wrote. These endearing quotes show just how much musical education impacts the lives of children, so we felt it was important that these served as the focal point of the website. To add a fun and interactive element, we also incorporated a keyboard that plays the notes when you run your cursor over the keys just below the student’s photos. Award-winning video and a live news feed showcased below the hero imagery on the homepage allow for users to learn more about the organization’s mission and latest updates. Diving deeper into the website, we ensured that users could find what they were looking for through a simple navigation and organized layout. Whether a user wants to donate a piano, apply for a piano, or get information on classes and camps, they can find the information quickly and take action. Throughout the site, we incorporated new colors that Pianos for People uses in other materials to make their branding consistent. The website is fully responsive, so no matter if users are accessing the website on a mobile device, desktop, or tablet, they will be greeted with a fully functioning, easy to navigate website. Pianos for People’s online presence now matches the organization’s creative work and inspiring mission. Check the new website out for yourself at pianosforpeople.org.